Representatives of CBL & Associates Properties, Inc. attend MAXI Awards in Las Vegas on Sunday, May 22, 2016. The International Council of Shopping Centers (ICSC) announced the winners of the 2016 U.S. MAXI Awards, highlighting the retail real estate industries most innovative marketing events, programs and technologies that added value to shopping centers across the country. 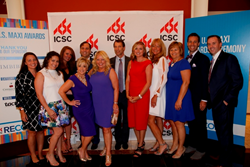 ICSC honored the winners on Sunday, May 22, 2016, at an awards ceremony during RECon, the global real estate convention in Las Vegas. CBL & Associates Properties, Inc. had a total of eight finalists for consideration, the most of any shopping center owner and won the most awards as well, bringing home three gold and four silver. CBL won gold for programs at CoolSprings Galleria in Nashville (Franklin), TN, Fayette Mall in Lexington, KY, and a joint-center entry at Volusia Mall, Pavilion at Port Orange and Hammock Landing in the Daytona Beach, FL market. MAXI Silver was awarded to programs at Hamilton Place in Chattanooga, TN, Monroeville Mall in Pittsburgh (Monroeville), PA, a joint-center entry for Chesterfield Mall, West County Center, South County Center, Mid Rivers, and Northpark Mall in the St. Louis market as well as a CBL corporate marketing entry. In addition, CBL was also awarded the ICSC Foundation’s Community Support Award for the Southern Region. For a complete list of CBL award winners and entry descriptions please visit cblproperties.com. Founded in 1957, ICSC is the global trade association of the shopping center industry. Its more than 70,000 members in over 100 countries include shopping center owners, developers, managers, investors, retailers, brokers, academics, and public officials. The shopping center industry is essential to economic development and opportunity. They are a significant job creator, driver of GDP, and critical revenue source for the communities they serve through the generation of sales taxes and the payment of property taxes. These taxes fund important municipal services like firefighters, police officers, school services, and infrastructure like roadways and parks. Shopping centers aren’t only fiscal engines however; they are integral to the social fabric of their communities by providing a central place to congregate with friends and family, discuss community matters, and participate in and encourage philanthropic endeavors. For more information about ICSC visit http://www.icsc.org and for the latest news from ICSC and the industry go to http://www.thecenterofshopping.com. Headquartered in Chattanooga, TN, CBL is one of the largest and most active owners and developers of malls and shopping centers in the United States. CBL owns, holds interests in or manages 147 properties, including 92 regional malls/open-air centers. The properties are located in 31 states and total 85.7 million square feet including 8.0 million square feet of non-owned shopping centers managed for third parties. Additional information can be found at cblproperties.com.